Subtract will release their long-awaited fifth album "Talk Minus Action Equals Nothing" this week, and are hitting the road to celebrate. The battering rhythms, militant aesthetics and belligerent riffing that have long been the band's hallmarks have been unleashed in the greatest realization of their sonic vision to date. As intense and straight up heavy a prospect as one will witness in any metal band. 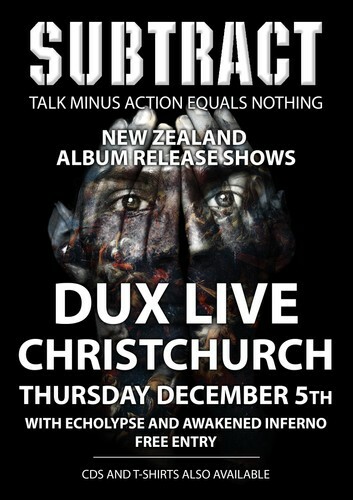 Subtract are set to tear the roof off the Dux Live to celebrate the new album with Awakened Inferno and Echolypse. Get in the pit for some of NZ's finest metal!